Thank you to all our supporters. It’s not too late to join them! Become a Sponsor. As we come to the end of another year in Pharr’s history, we look with pride at the legacy we are leaving as we contribute to our city’s growing and ever-changing landscape. With a focus on enhancing the quality of life for our Pharr families, we have gone back to the basics – improving streets, drainage, infrastructure, and expanding our city’s parks footprint to give Pharr families more options to pursue quality, outdoor recreational activities. 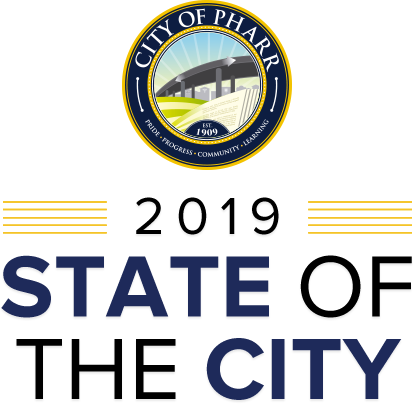 We enhanced city services and amenities to the south and north sides of Pharr, including a new fire station and the Development and Research Center in South Pharr, and on the north side, a new water tower and improved and enhanced access to major transportation arteries such as Owassa Road. We remain committed to improving safety, transportation and infrastructure to meet the demands of Pharr’s rapid and expansive development. At the same time, we continue to cultivate partnerships and regional collaboration with local, state, and federal partners, resulting in increased attention, resources, and funding for priority projects. We also welcomed new businesses and entertainment venues, such as Topgolf Pharr, which will bring hours of enjoyment and entertainment – as well as sales tax dollars – to our community and our local economy. 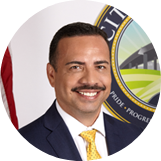 As we look back on all our successes over the past year, we want to invite you to save the date for our annual State of the City Address on Thursday, January 17, 2019 at 11:00 a.m. – 1:00 p.m. at the Pharr Events Center (3000 N. Cage in Pharr). We hope that you will consider helping make this year’s event as successful as previous years by sponsoring our event. All sponsors will be recognized at the event at their respective level of contribution. Please see enclosed sponsor packet for more details. We continue to support our Pharr families, businesses, and employees. We are proud of the exciting work we continue to achieve together, and we look forward to sharing our accomplishments with you and our business and community leaders at this year’s State of the City Address.